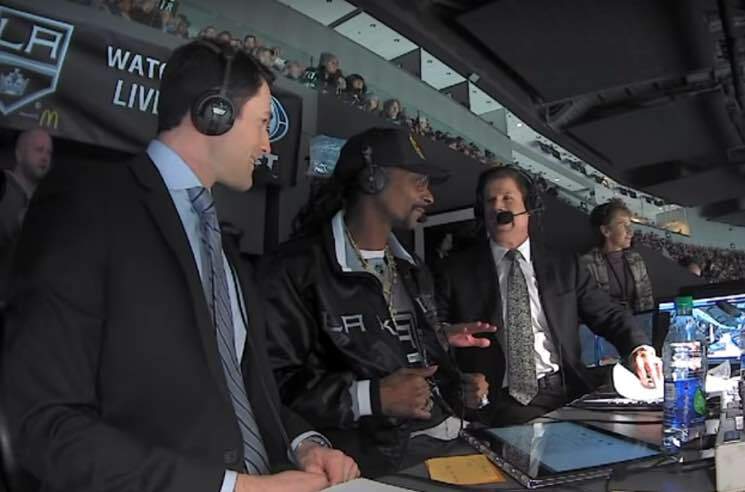 The Los Angeles Kings and Pittsburgh Penguins faced off Saturday night (January 12) in L.A., and while Snoop Dogg was on hand to drop the first puck (like it's hot), he really stole the show when he took over the commentators' booth. While in the broadcast box, Snoop welcomed people back to "Hockey 101 with Snoop Dogg," and re-declared his mission to "show people that hockey's a cool sport." He also revealed that he'd previously drank out of the Stanley Cup, and said that he'd love to play hockey, but "the only problem I have" is that he can't skate. Snoop also gave hockey lingo a much-needed update, and even gave Dion Phaneuf his own remix to Ludacris' "Move" when the former Toronto Maple Leaf started picking a fight. Watch a hilarious compilation of Snoop's visit to the Staples Center below.